Aereo was the bad boy of the cord-cutting revolution, until it was declared unlawful by the Supreme Court and scrapped for parts. Undeterred by that monumental setback ex-CEO Chet Kanojia has another idea ready to challenge the status quo—and it’s a system called Starry. The Starry Station, pictured above, is part of that system, and at its most fundamental, it’s just a wifi router. But it comes with a few more tricks than your traditional internet spewing machine. 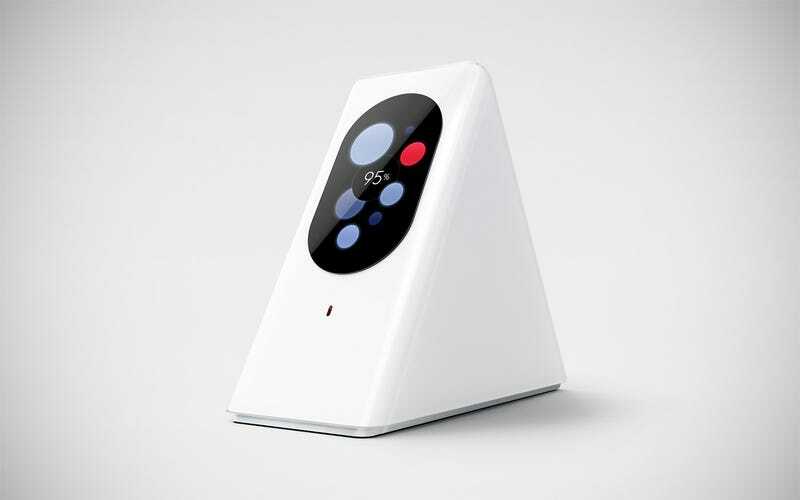 For one, the touchscreen provides glanceable data related to your wireless connection provided by Ookla. But its big, headline-grabbing promise, is that it will also help bring gigabit internet to your home. The company’s plan actually involves three pieces of technology: the above mentioned Starry Station is optional, but the whimsically named Starry Beam and Starry Point are not. Starry Beam is a node dropped on a rooftop with 1 to 2km radius which directs waves to the Starry Point, which is a small device connected to your home. (It seems most likely that it’ll be attached to your window as shown in the video). Then bam, you’ve got internet. Starry Hub just facilitates the connection. Starry also says this setup is perfect for densely populated areas. The real appeal is that all this tech is scaleable and for (theoretically) a fraction of what other infrastructure requires to deliver fast internet, all with fixed wireless broadband. But as The Verge reports, there’s a lot of unanswered questions as to how this will actually work. For one, Starry will use millimeter waves which already have a tough time penetrating walls and other obstacles. Kanojia even described millimeter wavelengths as “witchcraft.” So yeah, questions remain. Boston will be Starry’s guinea-pig city for testing the service and more cities will be announced throughout the year. Reservations for the router will start on February 5th with general availability beginning in March. The router doesw work with other ISP’s beyond Starry and also comes equipped with 802.15 for the oncoming IoT future. Although Kanojia is basically declaring war on ISPs with Starry, he’ll stick with the traditional tiered pricing model. Prices haven’t yet been announced but it’s reported to be “noticeably cheaper” than regular broadband. In some ways, Starry is like the Hyperloop of home connectivity, leap-frogging the traditional fiber way of delivery high-speed internet, and trying what could be the future. However, just like the Hyperloop, who knows if it’s actually going to take off.